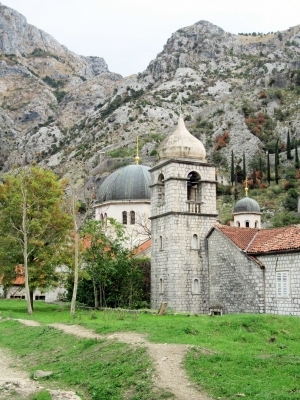 The Natural and Culturo-Historical Region of Kotor encompasses the cultural heritage around the Bay of Kotor. The bay has been inhabited since antiquity and has some well preserved medieval towns such as Kotor, Risan and Perast. 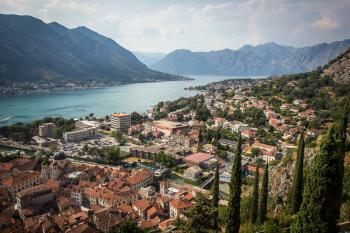 In the late 14th century, Kotor was seized by the Venetian Republic. It became an important commercial and artistic center. Its city walls received their current structure in Venetian times too. The circumference of the outer wall is 4.5 km. It represents one of the most important examples of defensive Venetian military architecture. The area has been hit with severe earthquakes in 1563, 1667 and 1979. The last one, which measured 7.0 on the Richter schale, damaged many buildings and led to the subsequent inscription on the WH List and the List in Danger in the same year. Kotor was an early inscription, and it might have profited from that ànd the earthquake it suffered from in the same year. It entered in the same year as Split and Dubrovnik, which it resembles. In 1997 this “row” of Adriatic coastal towns was extended with Trogir, another lookalike. It’s all a bit too much of the same to my taste. Kotor also is well on the beaten track for the average tourist, and large cruise ships do enter the Bay. There’s not much left to be discovered here. Kotor's natural setting and its impressive city walls running high uphill like a miniature Chinese Wall are its best assests. The town within the walls is quite small, and I did not find any especially impressive buildings. I visited the interior of the Cathedral, very Romanesque and well-restored. All major buildings have been restored, most of them were already up and running within 5 years after the earthquake. From photos I tried to gather how bad the damage was, but it seems that though everything was hit nothing was really destroyed. After I had seen all there is to see in Kotor Town, I hopped on a bus to Perast. This town lies half an hour north along the bay. In fact it is situated exactly across from the isthmus that connects the Bay of Kotor with the sea. Here the views of the whole bay are better than at Kotor itself. Perast is just another historical Adriatic coastal town, and does see its fair share of visitors. After Perast I walked 3km more to the north, to a town called Risan which is also part of the WHS core zone. I hoped to get away from the tourists, but was overtaken by the "Kotor Hop-on Hop-off Bus"! Risan was called Risinium in Roman times, and from that period some mosaics are left. 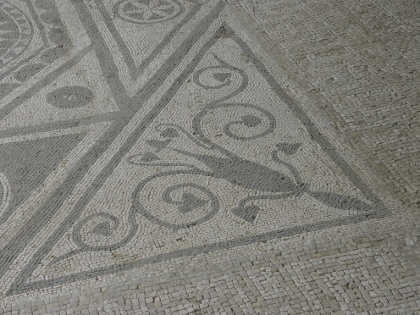 A 2 EUR-entrance fee gives you access to a covered area, where about 5 mosaics can be visited. Most of them consist only of geometrical motifs, some modelled after my favourite seafood: squid. As the coastal Montenegro and Kotor become more popular destinations, thanks partly to Kotor's status as a double WHS, I thought I would add my memorable experience there from back in April, 2010. From the castle I made a detour to the only house on the slope of the mountain (to get the free water springing out at the entrance) and headed up from there on the zigzag Old Kotor Trail all the way to the point called "Top of the Old Kotor Trail." The altitude of the castle is 200 m, but that of the Top is 500 m, so you can perhaps imagine the even more dramatic view over the Kotor Bay from the Top. The hike from the castle to the Top took probably about 2 hours and another 1.5 hours to come back down to the town of Kotor. To be sure, all of this is within the core zone of the WHS. When I mentioned my plan to hike up to the Top at the tourist kiosk in Kotor, they did not recommend it, as the trail is not designed for tourists and was not in the good shape at least at that time in 2010. 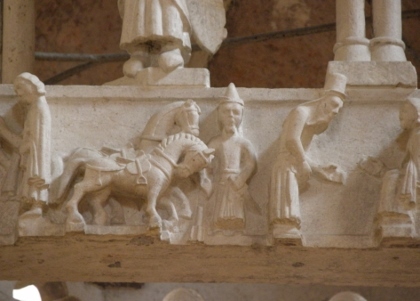 But the fact was that the Old Kotor Trail between Kotor and Cetinje located on the other side of Lovcen National Park has been used over a millenium to transport goods on the back of donkeys! In fact I saw a local with two donkeys on the trail even in the 21st century, although I don't think he was going all the way to Cetinje. I would highly recommend this historic trail. This was one of the best half-a-day hikes I've ever done. But in fact the best part for this hike was not the trail itself, the view or even the donkeys, but a goat. This goat I encountered on the way back near the Top followed me, to my disbelief, for several kilometers all the way down to the house where, as it turned out, she belonged. (All of this is photogenically chronicled at the link below.) It was no surprise, then, that the family of the house had given me a freshly-made round goat cheese with the diameter of about 20 cm on my way up and now even runs a Cheese Shop at the house, according to Google Map. Alternatively, if you have a car, you can drive to the top of Mt. Lovcen at 1750 m in the namesake National Park, where you can supposedly see not just the Bay of Kotor, but also all the way to the Adriatic Sea. But this NP is not part of the WHS. I had great expectations for the Natural and Culturo-Historical Region of Kotor when I visited in October 2017, since it would be my first visit to Montenegro. Unfortunately, the city seemed rather sleepy and empty when I arrived. After hiking up the walls to the Castle of Saint John, I was treated to an amazing view of the city and the bay surrounded by steep rocky slopes. Small fields and farms were visible from the trail, as were the church towers and the red-tiled roofs in villages lining the bay. Kotor was slightly filled with more tourists when I returned to the city, but the squares still seemed quiet, making me wonder whether anyone other than shopkeepers and their cats (which are revered in Kotor) lived in the old part of the city. The fortifications around the old city were impressive, and I spent some time strolling the city walls. I also visited the Kotor Cathedral and climbed the towers for a look over the town. Although I was slightly let down by the city of Kotor, I appreciated its beautiful setting against the bay, and I highly recommend climbing the walls to the Castle of Saint John to experience the panoramic views. Logistics: There are regular buses from Dubrovnik to Kotor, and it is also a popular cruise ship stop. Upon arrival to Kotor, the city is extremely walkable. It’s set on a bay – but not just any old bay. This is one of the most stunning parts of the country with the shimmering waters, the dramatic mountains that come almost to the beaches, and the snaking coastline border between the two that creates rises and dips of the tree-covered range overlapping each other from any angle. The old town of Kotor is surrounded by old fortified walls but an extension weaves out up the mountain behind like an extra tentacle of a sea creature. It leads to a fortress at the top that was used to watch out over the bay for any potential invaders. Today it’s one of the main tourist attractions in town – although it’s a long and tough climb, especially in the heat of summer. I arrived in Kotor in July 2013 from Podgorica with two friends. It really is a beautiful town – all narrow medieval streets crowded by red-roofed buildings. The old town is car-free, so the only way to get around is on foot. The walls around Kotor remind me less of the gently undulating walls of Dubrovnik, and more of the exhaustingly steep Great Wall of China. Scaling the 280 metres in the heat of the day is not recommended unless you are prepared to get sweaty (though luckily there is a beer vendor half way up!). At about 250 metres you reach the fortifications, which even featured in the Napoleonic Wars as a French stronghold. In 1814 British captain William Hoste smoked them out after deploying his cannons on land in “a very unmilitary manner”. The view from the top was fantastic, as it had been at the various stopping points on the way up. I visited this WHS in April 2014. I spent 3 days here and I would have loved to spend more time as there is a great deal to see. Since I was arriving from Durmitor, I first visited Risan and its mosaics. There are only 5 mosaics to see and 4 out of 5 only depict geometrical designs. The only one with a coloured human figure on is visible on all Risan's postcards. Next, I visited Kotor proper with its fortifications and high city walls truly resembling the Great Wall of China at times. These fortifications are among the few Venetian military structures still visible and it is worth the uphill climb to the fort above Kotor to be able to appreciate the Bay of Kotor in all its majestic beauty. The Cathedral of Saint Tryphon I found less interesting than the Serbian Orthodox Church of St. Nicholas perhaps because I had already seen similar churches in Croatia. From Kotor I drove to Budva and headed to the luxurious picture-perfect Sveti Stephan. After that slight detour off the inscribed area, I headed to Perast which was my favourite place in the Bay of Kotor perhaps because it is very small and it offers a very laid back atmosphere. From there I took pictures of the two inscribed islands of the Bay of Kotor, namely Our Lady of the Rocks and St. George's. Then, after a glass of white wine, I paid 5 euro for a return trip to Our Lady of the Rocks and stayed on the island till I was the only one on it just before sunset. It was the highlight of my visit, if not of my whole trip in Montenegro. Bliss! No trip to Montenegro would be complete without a visit to the pretty town of Kotor, which resembles Dubrovnik a lot, but is slightly less crowded (altough it does receive plenty of cruise ships). With a similar Venetian-influenced past, it features many fine historic buildings, including St. Tryphon's Cathedral, an interesting maritime museum, and impressive city walls. Unlike Dubrovnik's, however, they are hard to climb as they stretch from the sea all the way up the mountains. 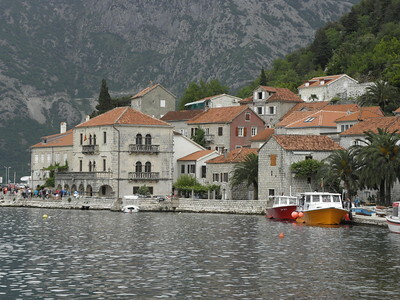 The WH site also consists of the smaller towns of Risan and Perast, as well as 2 offshore islands. The latter has a nice seaside promenade and a collection of well-preserved buildings. From there, you can also take a ferry to the island of Gospa od Škrpjela (Our Lady of the Rocks). It is the only artificial island in the Adriatic and features a beautiful Catholic church. The other island, St. George, features a Benedictine monastery, but is not normally accessible (unless you have a permission from the bishop...). Even though the site is called "Natural and Culturo-Historical Region of Kotor", it is only inscribed under cultural criteria. Nevertheless, the Bay of Kotor strongly resembles a Norwegian fjord and is the only such feature in the Mediterranean. Seen from the top of the coastal mountains, you can take in an incredibly beautiful panorama of bays, mountains, and islands that I think would justify a mixed site. Kotor and Perast are easily accessible by bus from the tourist resorts further down the coast, such as Budva, as well as from Podgorica. One of the most beautiful places in the world. I had the pleasure to travel by car around the bay. Amazing scenery. I went to Kotor for a day trip from Dubrovnik which seemed near enough (actually the border control took us three hours!). The old town is indeed beautifully situated and has large well preserved fortifications which can be climbed on for an even better view of the bay (requiring quite a lot of effort though). The old town offers great Italian food and was otherwise quite disappointing after Dubrovnik. It is not that it lacks the beauty but that it is so very poorly maintained. I can actually think of no other WHS I've been to where I saw such dismay. One of the churches I saw was fully loaded with rubbish and weeds, its facade and roof were on the verge of distruction. I can see how it could be made more appealing by a careful reconstruction and I wonder why it's not being done with the financial aid of Unesco (apparently nearby Croatia and Bosnia are better off and had the means to undertake the renovations on their own). This small city on the slope of a mountain is located in a breathtaking fjord which is the biggest in Southern Europe. The wall surrounding the old city goes high up the mountains and is lit at night. The location of the city, combined with the narrow marble streets and small houses, squares and beautiful churches make this place definitely worth the title of World Heritage Site. A visit to Kotor isn't complete without climbing high up the city walls, giving you a view overlooking the surrounding area (make sure to wear good footwear). It is hard to describe the Bay of Kotor. The best I can think of is like a Norwegian fjord dotted with Dalmatian towns and villages. Kotor itself is almost a small Dubrovnik, or maybe more like Korcula town. The typical old houses and cathedral have been perfectly restored after the 1979 earthquake. As well as Kotor, the villages of Perast and Prcanj - among others - on either side of the Bay, are little gems and remarkable views of the Bay can be had from either side. Also, a bit further afield, there are walled towns like Budva. With the Croatian border post near Herceg Novi now fully functional, Kotor and its Bay becomes a natural side-trip from the Dubrovnik area, with obviously increasing numbers of visitors taking this option. It's well worth it but a little more time to explore the Bay is an even better option. 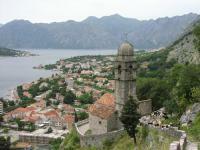 Rias: Includes part of the Bay of Kotor. Often called (wrongly) a "fjord" the Bay was never glaciated and is thus strictly a "Ria"